SEATTLE SEAHAWKS EXPECT Marshawn Lynch to return to practice on Monday as the team prepares for the NFL playoffs. Lynch will not play in tomorrow’s regular-season finale against NFC West champions Arizona Cardinals, but the Seahawks have nevertheless provided an encouraging update on their star running back. “The latest update is that he’s really doing well,” head coach Pete Carroll said at a news conference. ”He’s done about all that he can do at that end of it, so that’s great to hear. Lynch has not played since Week 10 as he continues to recover from an abdomen injury suffered in mid-November. With the other Seahawks running backs — Fred Jackson, Christine Michael and Bryce Brown — averaging just 3.8 yards per carry and zero touchdowns, the return of the player nicknamed ’Beast Mode’ could be crucial as Seattle target a third straight trip to the Super Bowl. The Seahawks have already clinched a playoff berth, but could be the number five seed with a win at Arizona tomorrow. 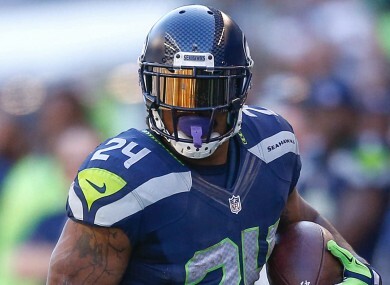 Email “Playoff boost for Seattle Seahawks as Marshawn Lynch is finally set to return”. Feedback on “Playoff boost for Seattle Seahawks as Marshawn Lynch is finally set to return”.